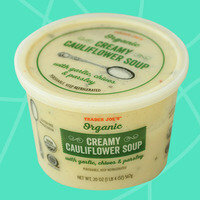 I was so happy to get an entire email of Trader Joe's food finds from you last fall! Any chance you'd consider putting together another one? HG + TJ's = a match made in heaven! This may be the seasoning find of the century... 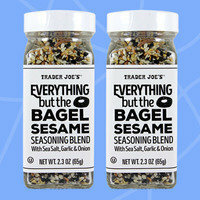 It makes anything taste like an everything bagel! I've been sprinkling it on egg whites (scrambled and hard-boiled), steamed broccoli, and cucumber slices topped with light cream cheese. I am in LOVE with this stuff! It even inspired a new recipe, coming to your inbox very soon. (Don't subscribe to HG emails? Sign up!) You do NOT want to miss it! I love pretty much everything about this heat-and-eat chicken. 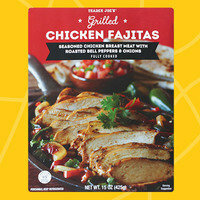 It's perfectly seasoned with Tex-Mex flavors and tossed with yummy roasted bell peppers and onions. The chicken itself is thinly sliced and super tender. Mmmm! It's the perfect start to a quick and easy meal. Roll it up in corn tortillas, throw it over a salad or cauliflower rice, or just dig right in. All-natural chicken sausage crammed with fantastic flavor? Yes, please! And since these links (which are large) are fully cooked, they brown up and are ready to eat in no time. I like to chop one up and stir-fry it with veggies and some sauce. Honestly, it's a great standalone snack too! 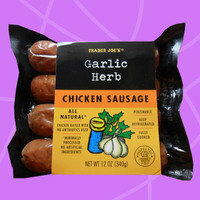 Bonus: These can be used in any HG recipe that calls for fully cooked chicken sausage. You know my love for cauliflower runs deep, and I'm not opposed to letting someone else do the work. This refrigerated soup is flavored with garlic and parsley, and it has some chives in there for texture. Heads up: It has a bit of a kick to it! HG tip: Think beyond the bowl. This soup is great as a sauce for chicken and veggies. Yum! Healthy greens + cheesy deliciousness = A+ in my book! 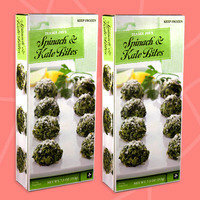 Serve these super-tasty little spheres as party appetizers, or heat up a few for a mid-day snack. Find 'em in the frozen food section. They're a great freezer staple for unexpected guests or snack cravings! 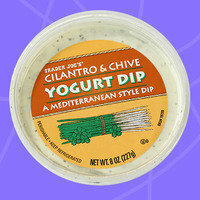 The folks at Trader Joe's know their way around a delicious dip, and this yogurt-based option is no exception. Creamy yet low in calories, I love that neither the chives nor the cilantro is overpowering. Aside from using it as a dip for cut veggies and baked tortilla chips, I plan on spreading it on turkey slices (low-cal rollups!) and spooning it into halved hard-boiled egg whites. Vegetarians and meat eaters alike flipped for this find at Hungryland... even a few tofu skeptics! It has the perfect texture (firm yet easy to bite into), and the teriyaki flavor is on point. Cut it up and add to anything: salad, mixed veggies, cauliflower rice... You name it. You could also slice it up and layer it with tomatoes and lettuce on a 100-calorie flat sandwich bun. Look for it in the refrigerated case, with the other meat substitutes. Today, March 8th, is National Peanut Cluster Day. When we're craving the combo of crunchy peanuts and rich chocolate, we reach for these Mini Snickers Pies. 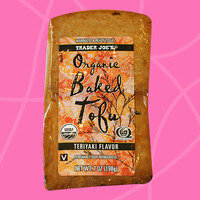 Everyone loves Trader Joe's, so share this list with everyone! Forward it ASAP, or click "Send to a Friend."